When I first visit Korea 8 yrs ago, it was my very first time tried kimchi and eventually I have grown to love it so much. I can eat the rice with just kimchi alone. 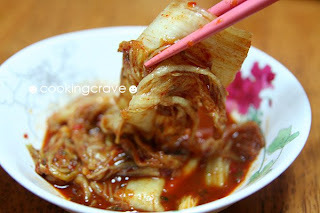 The sweet, sour and spicy flavour of the kimchi really appetizing. All the while I will just have kimchi at our local korean restaurant or bought the ready made kimchi from the store, until one day my aunt from Singapore shared her recipe with me. I tried and it turn out a lot better than the one I bought from the store. 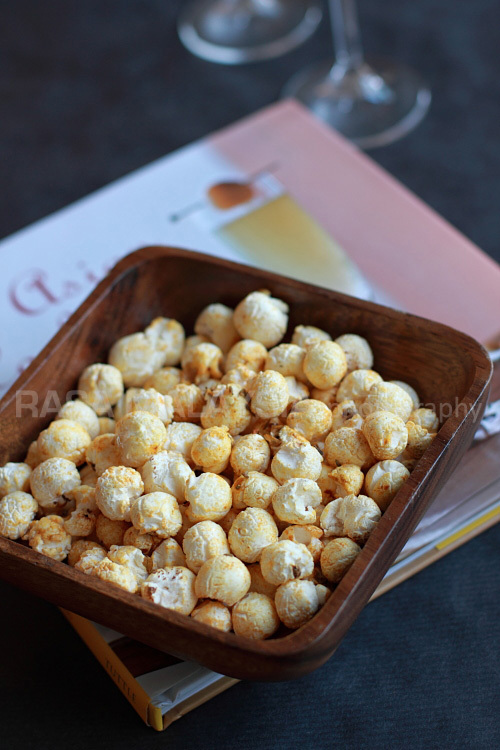 Note: the amount of the ingredients used can be adjusted to our own liking. The most important ingredient for making kimchi is getting the right korean chili flakes. I have tried other chili powders but nothing else will give you that authentic taste. Korean chili flakes has a wonderfully sweet taste that accompanies the spice. It is not too spicy to compare with the chili powder available in Malaysia. 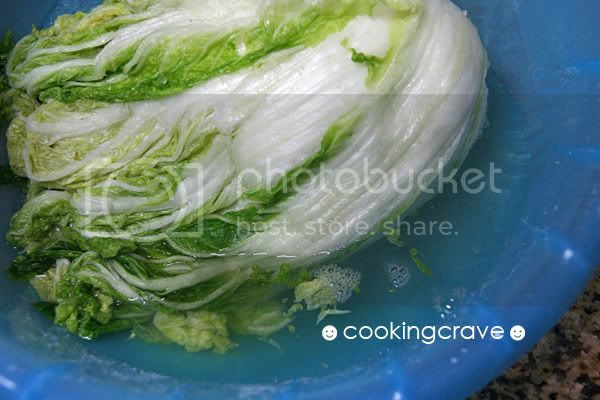 Wash the cabbage layer by layer. We can cut it into quarter for easier wash and drain to dry. 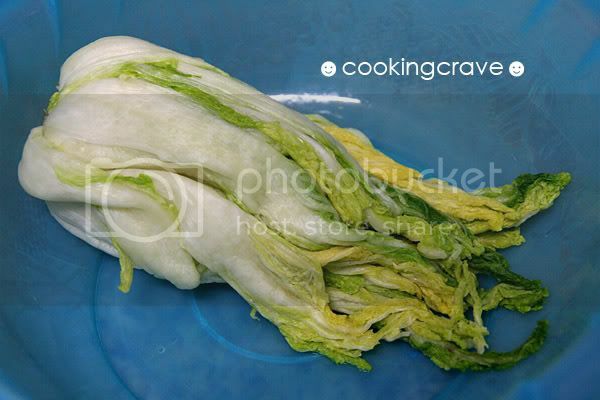 Sprinkle the layer of cabbage leaves with the coarse salt evenly. Set aside for a couple of hours - 4 hours. The cabbage will drain off some of its water and will shrink in volume by about 1/3. Rinse well with running tap water to remove the salt and drained. In a large bowl mix the ingredients - chopped red chilli, garlic, spring onion, ginger, chili flakes & fish sauce. Cut the cabbage into whatever size u like. I prefer it about 2 inches. Add the cabbage into the bowl of mix ingredients and mix well. Fill the cabbage into dry and clean sealable glass jar. Leave some space at the top about 1-2 inches to allow the gases to escape. Leave the jar at room temperature for 2-3 days and then store in the refrigerator for about one week. It will slowly ferment in the fridge. 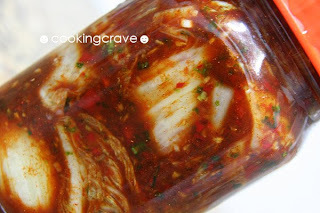 My jar shown above is probably too full and likely to spill kimchi liquid out of the top as it ferments. The younger it is the sweeter the cabbage tastes. If you like it more sour just let it ferment longer. 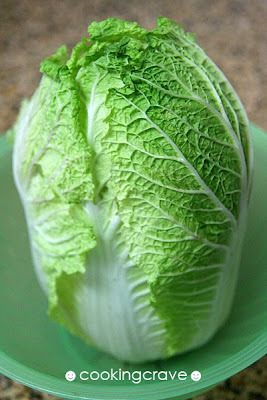 Cabbage will drain off some of its water after 4 hours. Cabbage shrink about 1/3 of it size. hey, Amy. 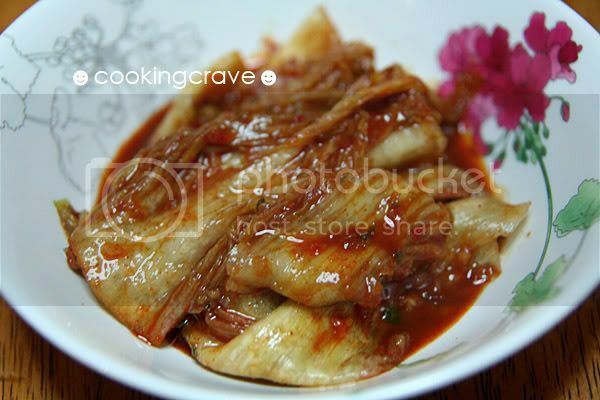 i've not tried making Kimchi on my own. but your step by step methods are very good. Gives me some confident to try out on my own too. 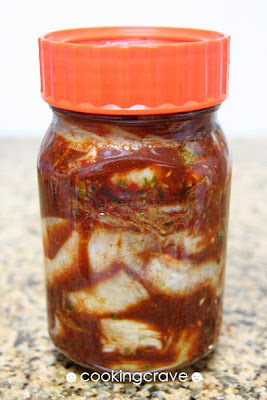 Making you own kimchi is easy and fun. This reminds me that I am out and I need to make some more. hi Amy, I don't know what my parents use for the chilli flakes but it's definitely not Korean chili flakes. Friends from Korea who came to my house after eating my parents' kimchi, even tapao back to Korea. One of the secret ingredients that my parents used is homemade cincaluk, really bring the flavor out. Just like how Koreans use the oyster in some kimchi making.